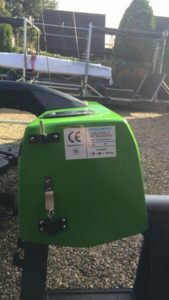 I designed, developed and started to market the S1Race to fill a gap in the market for an affordable, modern, fast, lightweight and easily managed on and off the water singlehander. 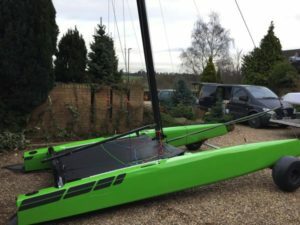 The concept came about because I believe there is a hole in the cat/dinghy market for an affordable, fast, easily managed single hander, something that has the performance of a 49er but can be sailed one up. 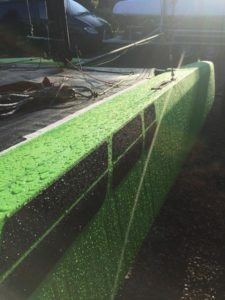 Therefore the S1Race has been designed purely as a race boat, to perform around the cans in a mixed fleet, i.e cats and dinghies as well as in mixed cat fleets and one design races. I would like both to convert dinghy sailors who want the speed but who don’t want to do a lot of swimming so steer away from a Musto Skiff, maybe the slightly older sailors who has lost a little mobility, and to offer catsailors coming from double handed classes who have lost their well trained crew and want to go sailing whenever they have time and willingness. 2) mast, beams, boom, rudders, boards, foils and foil kits are all pre-preg carbon processed in an autoclave at 120 degrees and 6 bar pressure.